The Boss’ heart sank as his personal challenge/objective for the first year as an Assistant Warden was to build a herb garden. “…but I’m not very creative… but there’s no power tools on site… when will I have time” he spluttered in half-hearted excuses. While he may not be so creative, he likes a puzzle and will ‘have a go’ at anything. He reckons he could play a Beethoven Symphony on the piano, which he can’t play, if he watched it on YouTube first. 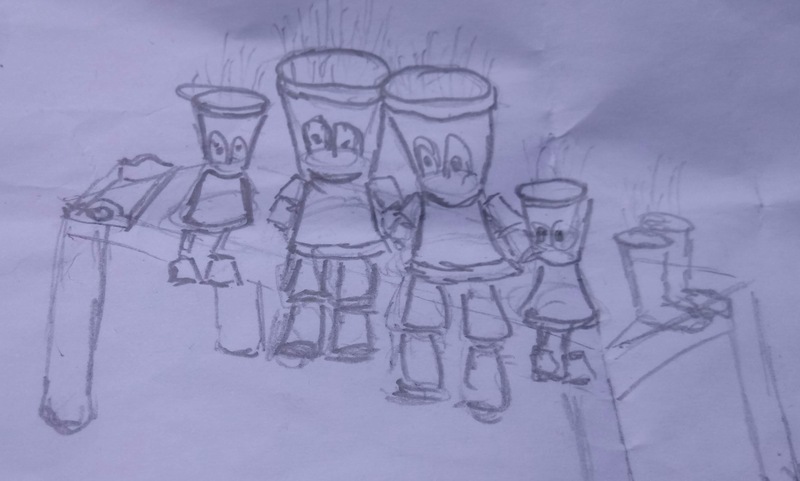 I stepped in for the first part, the ‘creative’ bit, “Why not build a flower pot herb garden based on the flower pot people we saw in Millau last year in France?” His heart sank further, he thought he was just going to nail some planks together. Matt and Tracey, our Wardens, said that sounded good, The Boss suggested I keep my ideas to myself a little later when we were alone. A couple of weeks later he sketched a draft of the plan, this rough picture remained the only official plan as the whole piece was built without tape measures, straight edges or any common sense at all, the way he likes it. He’d rather build it, dismantle it, then build it better than be sensible. The job became a bit of an ‘up-cycle’ project as wooden pallets were broken down for the bench, old fence wire for body joints, broken shower rails, garden decking from our neighbours, old nails (painstakingly straightened as taught by his Dad years ago) from the pallets and … finally … at last … the Lolly sticks we have been keeping for years in our ‘Caravan Spares Box‘ …just in case. The only items purchased were the flower pots, acrylic paint (more about that later) and a galvanised steel strip. We are to be reimbursed for the flower pots from petty cash so the title ‘Gift’ is more in regards to the labour, or “bloody stress” as he would say. After struggling with the preparation for the bench using hand tools, nothing with an electric lead allowed in the site workshop, all the wood was bundled in the car and taken home for some ‘electric jig-saw’ attention, whilst simultaneously starting the flower pot build. Inevitably, one pot made it from the garden table to become numerous pot pieces on the garden floor, “Can you just nip to the Garden Centre Deb?”, the ‘ex’ pot became the tester for paints, designs and varnish later in the process. The two large faces were painted as a shameless ‘steal’ from the flower pots we saw in Millau, France, so thank you to ‘Whoever’. The small ‘children’ faces were ‘made up’ by The Boss so one looked cheeky and one looked happy. It seemed an obvious decision to paint the ‘adult’ pots in Caravan and Motorhome Club uniform but he tortured himself for at least a few seconds over the stereotypical idea of boy in shorts, girl in dress scenario, before deciding, if someone complains, he will tell them they are both boys and one has identified as a girl for the last five years and has every entitlement to wear a dress, so you’ve been warned, don’t go there! We did not have the required ‘Plum’ acrylic paint for the uniform t-shirts so he took to EBay and declared he had identified the colour, two days later the ‘Pink! !’ paint arrived at work… doooh… “No bother” he says, “I’ll mix it with some red”. He did, perfect match, don’t you just hate a clever so and so. The club logo was added with the aid of a pound coin as a template, though he did complain the coins are not round anymore. After a day of handling machinery at work he didn’t trust himself to paint the petals on the girl’s dress so I finally had some input, and he says a great deal of faith placed on me. Once he had painted the pots I could tell he was warming to the project as they were starting to look good. He has a habit of standing back and admiring his work if he likes it, he was starting to stand back quite a bit. 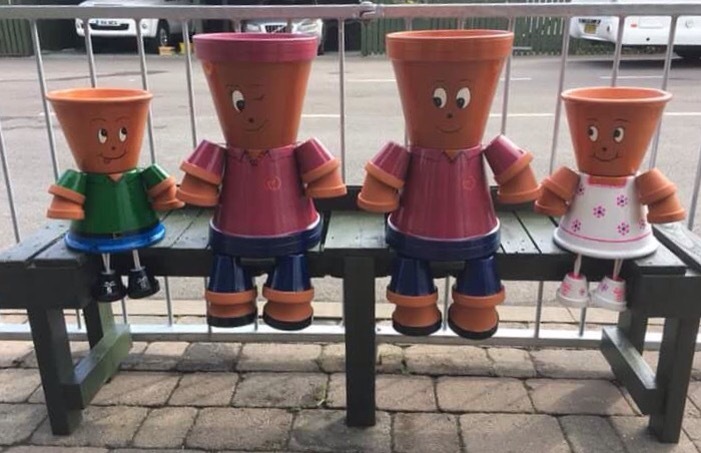 He ditched the original idea of having a plant box and Wellington boots at each end of the bench… because… he ‘cocked up’ by forgetting the width of the arms when he lined up the ‘arm-less’ pot people for the first fit on the bench. “If only I’d used a tape measure” is what I think he said, or was it “Oh, Bugger”. Various bits of wood, fence wire, clips and the galvanised metal strip were employed as the skeleton to hold the arms and legs in place before bolting it all on to the bench. Then we had one last problem, we needed rope for the children’s legs. We did not have any and it was the only thing stopping the full ‘unveiling’ to the world. Club member to the rescue, not just any member actually, a Facebook friend who had seen our dilemma and was staying at our site, “Will this do?” She asked the next day before handing over the perfect length of rope to complete the job. Thank you Mary. The completed article was unveiled, or should I say hastily screwed in place by The Boss lying on his back as members stepped over him outside reception to get their morning paper just in time for the bank holiday masses. The other Assistant Wardens teased that he was going for ‘Warden of the Year’ which he took as a back handed complement. Then that was it, objective delivered, he says someone else can plant it … then as he turned away he said “Now keep your fancy ideas in your bloody head in future”. He’s pleased really, I can tell. Brilliant but I have a couple of other ideas!! Tell the boss he’s done well….. Thank you. Look forward to seeing you both at the end of the season too. Permission granted to reproduce in whole or part only when inpursuitofadream.com identified as owner. All information intended solely for entertainment purposes only. You should not act or rely upon this information as it does not constitute professional advice.